This is an important time for Shambhala: we are actually manifesting many of the principles that we have so long held dear. But it is a time when these principles seem to be more and more needed in the world. I invite all of you to take these principles into your own life as your vocation, to draw inspiration from them and to actually take that energy out, so that there is a real sense of the sun shining and the brilliance of what is happening. We are happy to report that most of our centers in Northern California gathered together to celebrate Harvest of Peace this past weekend, with practice of the Shambhala Sadhana, food and conversation, and even a puppet show in Davis. In accord with the Buddha’s teaching that “Generosity is the virtue that produces peace,” friends of Shambhala around the region gave generously. We raised over $5,000 for our Regional Firebird Fundraiser which includes additional funds to support our local centers. 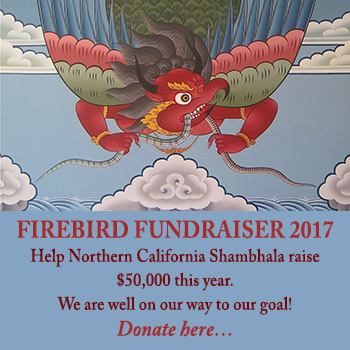 If you haven’t had a chance to give, please take a moment to support our Shambhala spaces, teachings, and administration in northern California. We have already raised over $33,000 this year. Please help us meet our goal of $50,000. You can read the Sakyong’s full address here. Click the image below to make a contribution and learn more about our Firebird Fundraiser.